This vintage real photo postcard features a young boy playing his small violin. He appears to be quite serious about his musical endeavor. The table next to him is holding his violin case. The boy and the location of the studio that photographed him are not identified. The postcard’s AZO stamp box indicates that the postcard dates to sometime between 1904 and 1918. A highly fashionable and pretty young woman poses for her portrait at an unidentified studio. She is wearing two bracelets, a ring, and a what looks to be, a strand of pearls. She certainly knows how to wear a hat and not hide her beauty. This is a vintage real photo postcard produced by a private studio. The card’s stamp box indicates that the postcard stock was produced by Crown Studios sometime between 1913 and 1929. These cabinet cards feature Marie Wainwright (1853-1923), an American stage actress and singer. She also appeared in three silent films between 1918 and 1920. Most of her fame came from the Victorian stage. She was born in Philadelphia and as educated in Paris, France. She received her acting training in Paris. Her first stage appearance was in New York in “Romeo and Juliette (1877)”. Her career flourished afterward. She spent many years in the Boston Museum company and later on, operated her own theatre company. During her career, she was the leading lady for Edwin Booth, Lawrence Barrett, and other well known actors. She appeared primarily in classics and high dramas until the turn of the century. She then appeared in more contemporary productions. Her resume includes roles in “H. M. S. Pinafore” and “Diplomacy”. When asked why she entered the acting profession, in a New York Times interview (1878), she stated that she did it for her children’s sake. Wainwright claimed that she was married before the age of fifteen, and had three kids before she turned twenty-one years of age. She stated that her husband was not supporting her and the children, and she needed to work for financial reasons. It appears that the breakup of Wainwright’s marriage was a hot news item. The marital conflict was quite dramatic and there were some questions about Ms. Wainwright’s character. The top photographic portrait is by Sarony’s New York City studio. Sarony was a famous celebrity photographer and other examples of his work can be seen by clicking on the category labelled “Photographer: Sarony”. This image shows Wainwright wearing a white gown and bonnet. She is holding a book and rosary beads. The second cabinet card was also photographed by Sarony. Miss Wainwright certainly was a pretty woman. The reverse of the cabinet card has an inscription describing some aspects of her career. There is also a stamp from a photographic supply dealer on the photo’s reverse. The dealer is C. E. Hopkins whose business was located in Brooklyn, New York. Mr Hopkins was an excellent self promoter as illustrated by mention of his name and business in several photographic journals of his time. For example, “Photographic Times” (1890) recounts that one of Mr Hopkins’s amateur customers produced a series of photographs pertaining to a duel, that Mr Hopkins had shared with the publication. 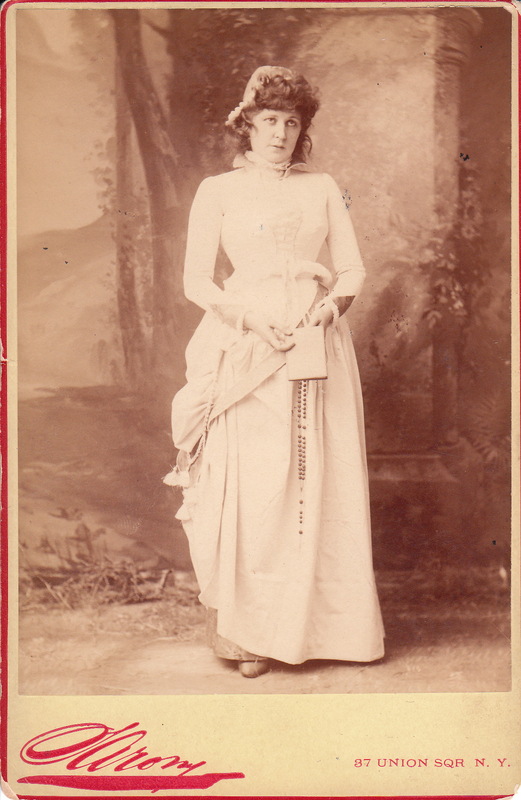 It is likely that this cabinet card portrait of Miss Wainwright once could be found “for sale” in C. E. Hopkins’s shop. This cabinet card portrait features a young woman posing for her portrait at the Ladmore & Son studio in Hereford, England. The woman is certainly making a fashion statement. I think the statement is “Please notice me”. The trim on her coat looks like black and white fur. The bottom of her sleeves also have fur trim. She is wearing black leather gloves. The trim on the front of her coat looks very much like she is wearing a long boa, though I think the trim is most likely part of her coat. She is wearing quite the plain hat, relative to her stylish overcoat. The reverse of the photograph has an inscription with the young lady’s name and age (19 years old). The location that this photograph was produced is Hereford which is a town in Herefordshire, England. The town is on the Wye River and about 16 miles from Wales. This vintage real photo postcard features a lovely couple. The handsome gentleman is in his crisp British military uniform and holding his hat at his side. Beside him is his pretty wife who is wearing an attractive long white dress along with a necklace and collar pin. The couple’s portrait was taken at Ward’s Studio in Reading, England. The postcard has excellent clarity. This vintage real photo postcard features a pretty young woman wearing a big and wonderful summer hat. She is wearing the hat at a seaside setting. She posed for this photograph at Cooper Brothers Studio at Promenade and Central Pier in Blackpool, England. This unused postcard has terrific clarity. This vintage real photo postcard captures a very photogenic family posing at a photographic studio in 1918. The photographer must have loved photographing this crew. The mother is quite pretty and she stares at the camera with icy but engaging eyes. The oldest of the siblings is wearing nautical clothing and is posed in a manner in which he seems to be protective of his family. By the way, where is dad? Mom is wearing a wedding band but father is missing from the photograph. The younger two children are adorable and definitely are sticking close to mom. This family could be doing commercials on television if there was such a thing in 1918. This scalloped edged postcard is unmailed. A very pretty woman sits on the rocks and poses for this splendid vintage real photo postcard portrait. The woman sits on the rocks along the shore of an unidentified body of water. The young woman is wearing a summer dress and has a parasol beside her. It is amazing to me how, dressed in a relatively tame fashion, she is just as attractive as any scantily clad model that appears in the Sports Illustrated bathing suit issue. I will admit, that the photographer most certainly posed her to reveal her partially uncovered calves. I guess sexual provocativeness sells postcards as well as magazines. This postcard has a message that is dated 1932. It was published by L. Bergeret of Paris, France. I don’t know if there is a connection between L. Bergeret and Albert Bergeret (1859-1932). Albert was a leading French postcard producer in France who operated in the city of Nice. In 1900 he produced 25 million cards and by 1903 he published 75 million postcards. I am wondering if L Bergeret may have been a successor to Albert Bergeret. L. Bergerets images seem to cluster in the 1930’s. This cabinet card photograph features a Bulgarian uniformed military officer and his wife. The officer is wearing a medal on his chest and is holding a pair of dress gloves. He is wearing high boots which may indicate that he is a member of the cavalry. The soldier’s wife is quite pretty. She is clutching a purse and wearing a pair of leather gloves. An inscription on the reverse of the photograph indicates that this portrait was taken in 1916. The photographer was C. Balus and the location of his studio was in Rousse (Pyce), Bulgaria. Rousse is currently the fifth largest city in Bulgaria. It is in the northeastern part of the country and is located on the banks of the Danube. The city is often called “Little Vienna”.